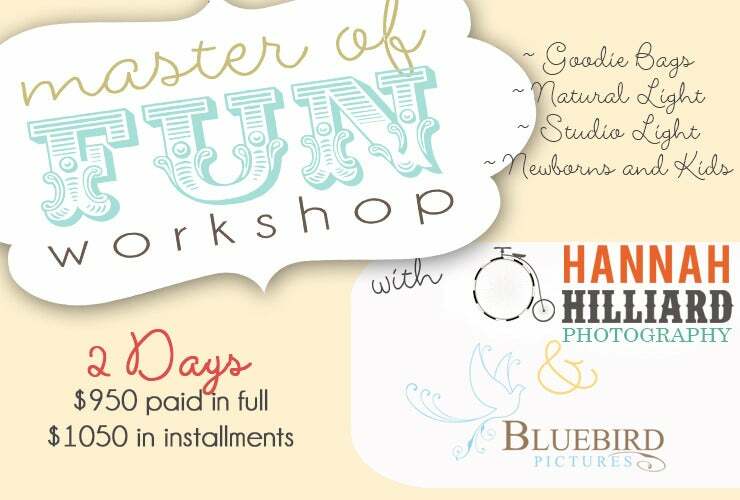 We are excited to introduce that Hannah Hilliard of Hannah Hilliard Photography and Bree Fowles of Bluebird Photography are teaming up for an amazing workshop experience jam packed with hands-on learning that will streamline your workflow and make post processing a dream. Both photographers will share their quick journey to success through smart business practices, savvy marketing and rich work. Hannah will work her studio magic with stylized children’s photography and Bree with her gentle and safe newborn touch full of bold and exciting colors. The workshop focus will be on studio light photography and stylized sessions. Attendees should be comfortable shooting in manual as the workshop will most benefit those looking to gain posing, style and lighting smarts. Workshop will be two days of learning and fun! Payment is reduced to $950 if paid in full. A workshop paid in full includes a non-refundable deposit of $350. You may transfer your workshop seat only. *all attendees will be required to sign an agreement stating they will not teach a newborn or children's workshop for 18 months after attending. *Master of Fun workshops reserves the right to cancel a workshop if seats are not filled 35 days before the event.